For those of you still on the fence about ordering your Tesla Model 3 or any other model or variant, Musk has just made the deal a little bit sweeter. The federal tax credit of $7,500 gets cut in half after December 31, 2018, so if your car gets delivered after the cut off, you only get 50% of that. Musk has now tweeted that Tesla will spot the remaining $3,750 if the car was ordered prior to the deadline and the customer has made “good faith efforts” to receive the vehicle before it expires. This is great news if you were in two minds about buying a brand new Tesla EV. 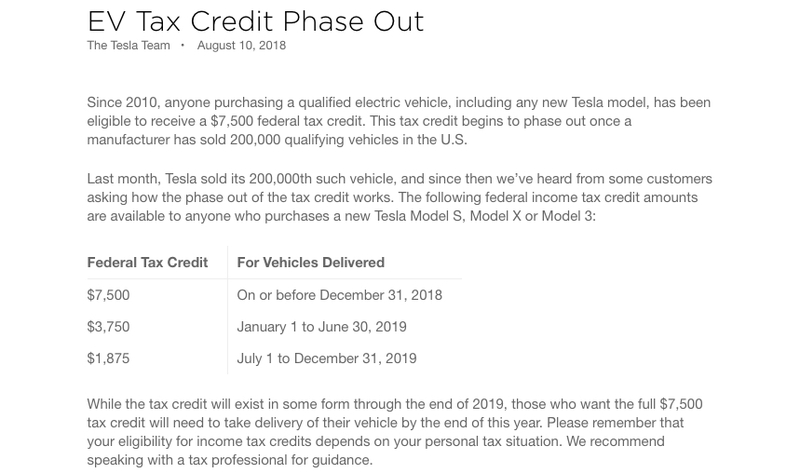 Any car ordered between now and the end of the year as good as gets the full tax credit if the customer sincerely makes all efforts to complete the necessary documentation and payments in time, as long as Tesla committed delivery. This creative way to offer a discount is a small gesture from Musk to help Tesla achieve its delivery goals as we approach the end of the fourth quarter, but in ‘projected hindsight’ it will be money well spent. Of course, it will hit the company’s bottom line directly, but the volume of such payouts is likely to be minimal. Well, that’s unless there’s a sudden spike in pre-orders from customers who fully intend to pay before the deadline arrives. Even so, compared to the deliveries already made this quarter, it’s likely to be a small percentage. Tesla is now mobilizing nearly all the cars in its fleet to ensure another record quarter for deliveries. Some customers have already been seeing delivery times in days instead of weeks. It depends on the configuration and color availability, naturally, but the Fremont factory will most likely be operating at full tilt over the holidays. Ferragu’s target price for TSLA was at $530 with a potential valuation of $300 billion, while the consensus target price is now $339 against a current stock price of $319.77 at the time of writing. Is this a question of Wall Street being conservative while Ferragu is factoring in some intangible upside? That’s possible, but with a company like Tesla headed by precedent-setting CEO like Elon Musk, it’s always been touch and go. By Musk’s own admission, Tesla nearly went down this year during the aggressive Model 3 production ramp. In 2008 Tesla was on the brink of bankruptcy when Musk took over as CEO. At any given point in time in its history, Tesla was either on the verge of death or perceived to be by the media and analysts. Not much has changed, but the majority of them have now softened towards Tesla and see it as a viable car company that will lead the way to a global future for electric road transportation. The road ahead is still long, but if Tesla can manage to break records quarter after quarter in its core Model 3 business and keep expanding to international markets while continually introducing new products to the market, a $300 billion valuation doesn’t look like it belongs in orbit. And Ferragu is in good company. Shortly after the Twitterbomb Musk dropped in August about taking Tesla private, another investment firm, ARK Invest, sent an open letter to Musk outlining a potential 5-year target price of between $700 and $4,000.